← Does a Pregnant Woman Have a Right to Die a Natural Death in Ireland? This morning, the High Court ruled that a clinically dead pregnant woman could have her life support switched off and be allowed to die a natural death, notwithstanding the constitutional right to life of her unborn child. The consensus was this was one of the most tragic cases to come before the Irish courts in recent years (see here and here). Unusually for a case involving the Eighth Amendment, there was little in the way of public outcry on the side of the unborn. Public opinion generally sided with the woman’s family in holding that she should not be kept alive artificially for a period of up to 18 weeks. Nonetheless, the legal position (outlined in last week’s blog here) meant that the possibility of doing just that had to be taken seriously; the lack of legal clarity meant that it could not be dismissed out of hand. In the absence of a legislative framework, the only way that doctors could be sure that their preferred course of action was within the law was to seek clarification from the courts. The consequence of a misstep would be criminal prosecution. Court cases hinge on two separate types of argument: issues of law and issues of fact. 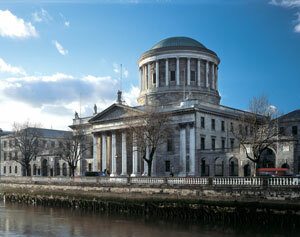 The two combine to provide the court with reasons why the case should be decided in one direction or the other. In this case, the issues of law were quite evenly balanced, with two established constitutional rights (each of which carries its own qualifications) in direct conflict. The crux of the case was widely expected to be the phrase “as far as practicable” in the Eighth Amendment: would it be practicable to save the life of the unborn child in this case? In part, this is an issue of law; what exactly does this phrase mean? However, it is primarily an issue of fact, and the medical evidence presented in the case was always going to be crucial in directing the Court’s decision. If the medical evidence had indicated that the unborn had a strong chance of survival – say, for example, had the woman’s brain death occurred at 20 rather than 14 weeks – then both the legal and factual issues would have been finely balanced, and the Court would have had an almost impossible decision to make. However, it became clear at an early point during the hearing on Tuesday that the medical evidence was unanimous in holding that the prospects of survival for the unborn were slim to none. Once this emerged, it was always likely that the Court would rule as it did, given the extreme measures that the mother would be subjected to in pursuit of such a slim chance. The judgment observed that the “entire medical evidence goes only one way, and that is to establish that the prospects for a successful delivery of a live baby in this case are virtually non existent”. While a detailed and considered analysis of the judgment will take some time, it can be noted at this early stage that multiple principles seem to be in play at once. The question of what was practicable does not appear to have been the sole legal concept relied on by the Court. Reference was also made to the mother’s right to dignity in death, and even to the best interests of the unborn child. The Court was careful to stress, however, that it was in no way influenced by any question of possible impairment to the unborn child should it be born alive; the decision was based on the absence of a realistic prospect of a live birth. A further passage of interest was where the Court rejected the argument that the mother no longer enjoyed a constitutional right to dignity as she had been declared dead some weeks ago. This will further add to the growing body of Irish jurisprudence on the concept of dignity. An interesting side issue was what the judgment would say about whether the Eighth Amendment had any application in this case. It had been argued by lawyers for the woman’s father that the provision had no application here as the case was not one about abortion. It is broadly accepted that the Eighth Amdendment was enacted to act as a bulwark against an Irish Roe v Wade 410 US 113 (1973) and to preclude the legalisation of abortion by court decision or legislative action. Indeed, the Supreme Court has twice made this point, in Baby O v Minister for Justice  2 IR 169 and Roche v Roche  2 IR 321. However, these precedents fail to get around the fact that the plain text of the provision makes no reference whatsoever to abortion. When the Eighth Amendment was enacted in 1983, Article 41.3.2° of the Constitution as it then was provided that “No law shall be enacted providing for the grant of a dissolution of marriage.” The Eighth Amendment could have followed this template, and stated something along the lines of “No law shall be enacted providing for the termination of pregnancy, save where the life of the mother so requires”. It could also have used Article 40.6.1°.i as a template; where that provision states that “The publication or utterance of blasphemous, seditious, or indecent matter is an offence which shall be punishable in accordance with law”, the Eighth Amendment could have stated that “The intentional destruction of unborn life is an offence which shall be punishable in accordance with law, save where necessary to save the life of the mother”. However, the provision did not adopt either of these formulations; instead, it utilised the broader formulation of “The State acknowledges the right to life of the unborn and, with due regard to the equal right to life of the mother, guarantees in its laws to respect, and, as far as practicable, by its laws to defend and vindicate that right.” This wording appears on its face to be considerably broader than the narrow issue of abortion, and justifying a conclusion to the contrary by reference to the intention of the electorate is a perilous path. Indeed, during the Roche litigation, a woman who voted in the 1983 referendum applied (unsuccessfully) to be joined as an amicus curiae party to the appeal on the ground that the Attorney General’s argument that the 1983 amendment did not apply to frozen embryos “completely misrepresented” the intention of those who voted in favour of the amendment to “protect human life” (See Carolan, “Court rules woman cannot join appeal on embryos”, The Irish Times, February 27, 2009). However, when the mother who dies is bearing an unborn child at the time of her death, the rights of that child, who is living, and whose interests are not necessarily inimical to those just expressed, must prevail over the feelings of grief and respect for a mother who is no longer living. In principle, therefore, the right to life of the unborn is engaged in a case where the mother is clinically brain dead (and, by implication, in any circumstances where the life of the unborn is under threat). The question for the future is whether the written judgment provides any clarity on the balance of interests in a case involving brain death at a more advanced stage of pregnancy. As long as the Eighth Amendment remains in the Constitution in its present form, the possibility of such a deeply tragic and private case being decided in the very public and distressing surroundings of the Four Courts will be present. A court decision, by its nature, can only ever have limited application beyond the particular facts of the case before the court, and the Court made a point of stressing that the case turned on its own particular facts. Perhaps legislation could be enacted to set out a clinical process for resolving such cases; but the Eighth Amendment was never really intended to be applied to cases like this, and any such legislation would only perpetuate this ill fit. While lawyers, academics and journalists will pore over the judgment and the reasoning therein for months and years to come, there can be little doubt that the outcome reached today was the most humane one available. Moreover, in such distressing circumstances, the absence of an appeal to the Supreme Court is most welcome; counsel for the unborn indicated that they were happy that the interests of the unborn had been fully considered. This entry was posted in Eighth Amendment, Right to Die. Bookmark the permalink.